You're playing in a multiple deck game where doubling down after splits is allowed. You're dealt a pair of twos, while the dealer draws himself a seven as an upcard. Should you split here, or just play the hand as a hard 4? This is an interesting situation because you've got a four, and figure you might a shot to build something against the dealer because the seven is not the best upcard in the world to have. When he has a seven showing, the dealer will, on the average, wind up with 19 or better only 23% of the time. On the other hand, this is not a bust bonanza for the standing player, because the dealer will break less than 26% here. And when you have a two, you will bust if you draw a couple of ten-value cards in a row, but otherwise, you might make a hand. The correct play here is to split up your twos. Your expectation in this situation is negative. But we can offset the potential loss by splitting the hand. If we hit here, we're going to be winning about 41% of the time, with about 50% losses. That's not great. We can mitigate our damages by splitting the twos. When the option of doubling-down after split is allowed, the negative expectation is actually a little less than 3%. 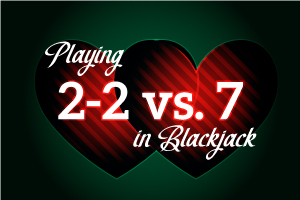 So you'll have a better opportunity to make winning hands starting with a two than you will by playing with a four.